Body Helix was founded in 2008 by world-ranked senior tennis player Fred Robinson of North Carolina. Fred observed that compression gear designed for muscle and joint problems had minimal effect, was uncomfortable, and was decades behind the advances of fabric science. This motivated Robinson to search for a material that would do three things better than any other material in the world of compression…stretch, rebound, and stay in place. That search led to the development of Body Helix’s Form-Fit Technology. Once Robinson had found the highest quality material available, he brought together a team to help him design products based on both the science of movement and the research on injury management. The team incorporated the findings of medical science and the latest technological advances in fabric science to design effective products with uniform compression that are incredibly comfortable to wear during exercise. In addition, the amazing material anchors to the skin with a layer of moisture (sweat), eliminating the need for constant adjustments. Add to these qualities the feature of being able to wash the high-tech material each and every time you sweat in it, and you have the World’s Finest High-End Quality Medical Grade Compression Helix. It’s not just the team at Body Helix that believes we are the best. We have given our products to some of the most respected sports medicine doctors and orthopedic doctors in the world, and they concur – Body Helix products are not only more effective, they are also more comfortable than any other products of similar design on the market today. Those same doctors urged us to enlarge our market, so it would include not just athletes but also medical patients in need of muscle or joint compression. As a result, you will find Body Helix being recommended by doctors and rehab specialists along with athletic trainers, physical therapists, massage therapists, occupational therapists and chiropractors. The team at Body Helix is proud to use the most effective, most comfortable, and highest quality material in the arena of injury management compression. 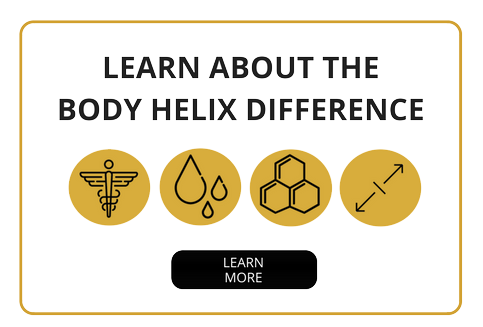 We offer Body Helix to you from our base in Greensboro, North Carolina, where we continue to research and develop new products in our quest to help others live life to its fullest. Our products reflect our mission to help keep people active. Thank you for your continued support.